in the second is showed how to align objects pivot to a reference object or cursor or about each object. The position offset works also for this feature. Hello. I want to show you the work of me and Anfeo about an align tool for objects. It’s a first version, that aligns tha location of the objects about their main reference points. Tha add on was developed here, a new forum for italian volunters add-on creators. But everybody is welcome. In these days I’ll provide a video to explain better, but you could already try it because it’s quite intuitive. Here a screen that make you understand next functions that will be implemented. Hope you apreciate! See you soon! thanks for your work.this is a much needed tool. is it possible to implement this - align 2 objects (say max-max in x) then “APPLY” then align same objects with different option(say min-max in y),without selcting them again. I understand what you mean. I’m looking about such a possibility. But! Actually, if you want to do so, you don’t need to reselect them, but you just need to recall the command. If the alignment is different, in any case you have to reset the parameters. What I’m trying to do is to remember the previous settings. Probably, to do so, I’ll need to put the tool in the tool shelf. That’s a possibility and maybe sppeds up the works sometimes, even if it takes a lot of space in the bar. I also want to create a version for edit mode. But I didn’t thinked about it completly. you should add this to bf-extensions! That’s a good thing! There’s the need to be able to align object axis or entire objects to the actual transform orientation. I think I could add the feature that aligns the object axis rotation to another object or to the transfom orientation. I’ll look to your script. Another feature I want to add is the “Drop to the ground” command. I would like to ask: how can I measure how far is my object from the first obstacle along an axis? Some editors of videogames have such a feature to drop objects to the ground automatically. I would add a similar feature. lell, do you know if there are problems with 2.63a 64bit official release and your script? because i have it activated in the addon list but it doesn’t works. In a few days (this week end) I’ll release a new version and I’ll try it with the last release. 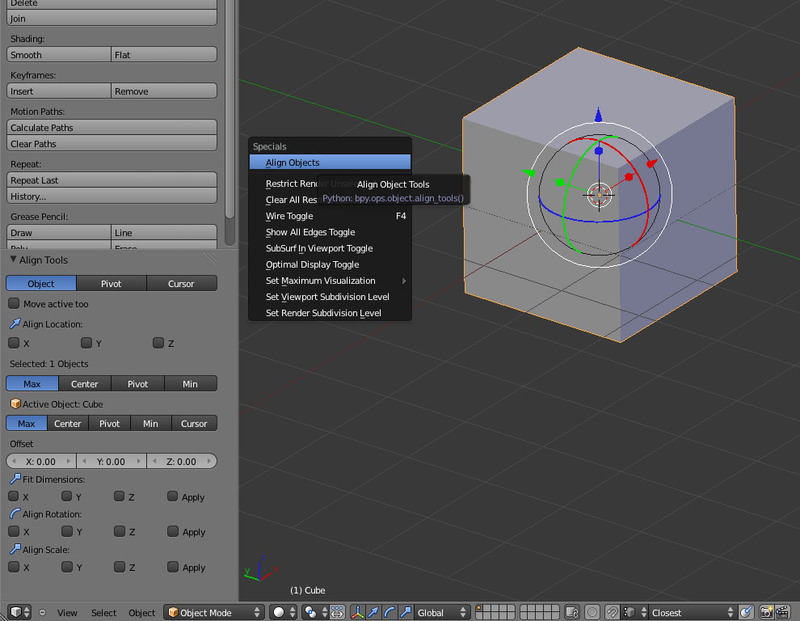 Last version, that works with blender 2.63.8 64bit from graphicall. Change Log in the next hours! do you have a projects page for it? Pay attention for the moment! The script works good with mesh object only with the most of the features. Could work with lights and similar, but only with pivot reference. So be carefull. I’ll add cheks for object types later.